My friend Christine is running in the Run To Home Base 9K race. It's not just a race, it's a fundraiser for the Massachusetts General Hospital in order to provide clinical treatment to veterans with combat stress and traumatic brain injuries and also to provide assistance and support to their families. So far, she's raised just under half of her $1,000 donation goal, and now I'm asking for a little of your help. What's in it for you, you ask? Besides the warmth and satisfaction of knowing you've done something to help your fellow man? How about a chance to win a bottle of the discontinued and coveted holographic beauty, China Glaze Kaleidoscope Him Out? China Glaze Kaleidoscope Him Out was part of the epic Kaleidoscope collection of hologram polishes that China Glaze released a few years back. All the shades are now discontinued and getting rather hard to find. 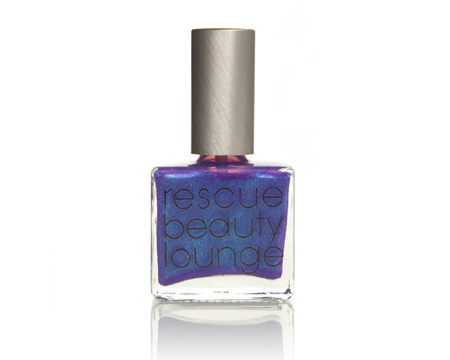 This particular shade is a soft silvered blue with a strong chunky hologram effect. Pardon the ancient picture, but I haven't had enough natural light to take a new one. A bottle of Scrangie by Rescue Beauty Lounge, signed by me? You will be the only person on the planet with a signed bottle! Like the China Glaze polish, this shade is also sold out and becoming hard to find. 1. For $2, you get one raffle entry. $4 for two entries, $6 for 3 entries, and so on. 2. To donate your $2 (or whichever amount you choose to donate) and enter the raffle, visit http://www.runtohomebase.org/runtohomebase/ChristineBatchelder and click "Make A Donation." that includes "kaleidoscope" in the subject line along with the name you donated under. Christine will keep a tally and assign you a number for each ticket/raffle entry based on the amount donated. 4. All donations must be in by 11:59pm, May 12th 2011 and a winner will be drawn at random on May 13th. The winner will receive one bottle of China Glaze Kaleidoscope Him Out and one signed bottle of Rescue Beauty Lounge Scrangie. This raffle is open to everyone! NOTE: ENTRY IS NOW CLOSED. Thanks for donating! That's so sweet that you're chipping in to help! Just made my donation, glad to help either way. Good luck to her!! This is so wonderful of you, Scrangie. I'm going to donate! just donated, this is great! i love to chip in here and there, when it goes to a great cause and when there is a chance i might get polish out of it, your friend is really lucky to have you support her! donated! glad to help such a good cause. Okay I donated! Thank you Scrangie for helping support the troops! Okay I donated. Thank you Scrangie for helping support the troops! That's a really good thing you're doing :) Can we in Singapore take part in this? How many bottles of "scrangie" did you get for your collection? I ask because it reminds me of when my sister's children were in the paper and she bought a whole bunch and mailed them to all the family. She was so proud. Did you do something like that? Its so fun to have things like that happen. You're a great person for helping out with this, Scrangie. IMO, our veterans don't get nearly as much help with brain injuries and mental disorders as they need. Hm, I already have both polishes.